This is a #1 size thread, about the same as a regular sewing machine thread. It measures approximately 100 meters. This thread comes in 3 colors Light gold, Soft gold, Wheat gold all 3 are 1/8 oz skeins, each are sold separately. 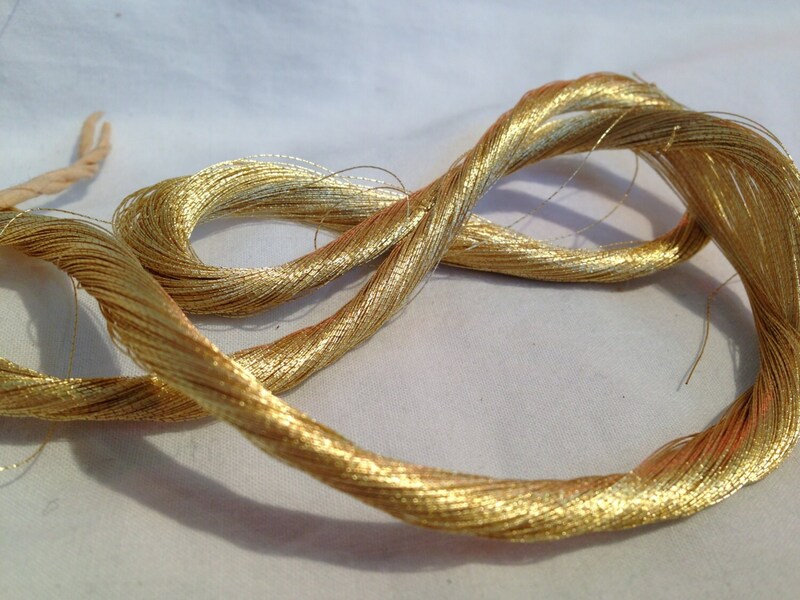 Our gold, silver and platinum threads were made in the 1920's by silk houses in Japan. The finest weaving using these threads were produced in a section of Kyoto known as Nishijin. 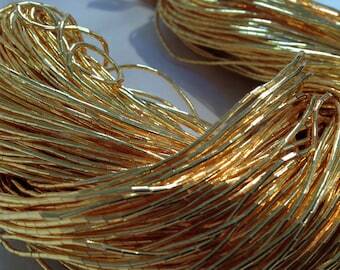 The precious metal threads are extremely rare and are only available when an old silk house goes out of business. Even then, they might not have any of these rare threads in their inventory. I first acquired the threads in 2002. I have not seen them since, until my buyer in Japan contacted me and said that an old silk house was closing and that they had advertised some of the precious metal threads as part of their inventory. I gave him the go ahead. He was able to purchase most of what was being sold (at auction) and I was happy until I learned the price. Realizing that it might be another ten years before I saw them again at an even higher price, I took a deep breath and paid for them. I have tried to keep the prices reasonable. I hope you will understand that while 24k gold and silver are pricey, platinum is even more so. It's hard to believe but the 24k gold, pure silver and platinum were hand wrapped by young children around a single silk thread. A one ounce skein measures 3,300 feet long! Tiny finger had to move very quickly to accomplish the task. While I am familiar with the gold, silver and platinum skeins, there are several others that I have never seen before; the small packets of a finer gauge wrapped in gold, and a much, much larger thread that almost looks like beads. Finally, there is a single packet of what looks like small round gold beads, most unusual. I apologize for the high prices on some of the skeins ask you to realize the age and the cost of the metals. Despite their age, the thread is still strong and usable. I hope you will appreciate them as much as I do. Love it, thanks! The packaging was very nice and the product is perfect. Thank you!!! Just as described.